The Internet of Things (IoT) is emerging as an unprecedented opportunity for many players in the communications, information technology, and (consumer) electronics industries. Although definitions of ‘IoT’, application scopes and growth forecasts strongly diverge – some analysts estimate the number of connected devices by 2020 around 20 billion connected devices, while the most bullish forecasts exceed 100 billion things – all sources agree that the IoT is going to be ‘huge.’ Estimates about the economic impact of the IoT show spectacular numbers too. While IDC is talking about $1.7 Trillion IoT spending in 2020, McKinsey believes that the market for IoT could reach $11.1 trillion by 2025. In this article we discuss the value of the Internet of Things. 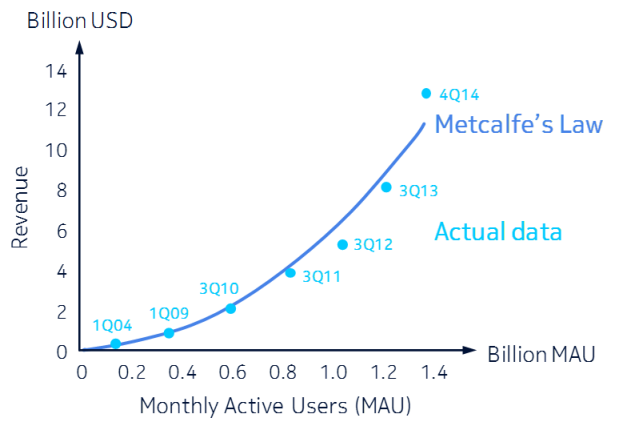 We take a non-crystal ball approach to measure IoT’s tangible and intangible value, and make an estimate of its long term value based on real market data. Starting from two established ICT industry principles, Moore’s law and Metcalfe’s law, we explore IoT’s evolution curve in terms of performance, cost and value. Note: “doubling every 2 years” suggests a parabola-shaped curve, but Moore’s growth function is almost always represented in a straight line ― complemented by a logarithmic scale on the Y-axis. But there’s more behind the chasm than consumers being slow (or conservative) in adopting new technologies, products, and services. As Clayton Christensen suggests in “The Innovator’s Dilemma: When New Technologies Cause Great Firms to Fail”, successful companies put too much emphasis on customers’ current needs, and fail to adopt new technology or business models that will meet their customers’ unstated or future needs. In other words, they need to deliver disruptive products and services. For example, the iPhone was a disruptive product, but the Apple Watch wasn’t. 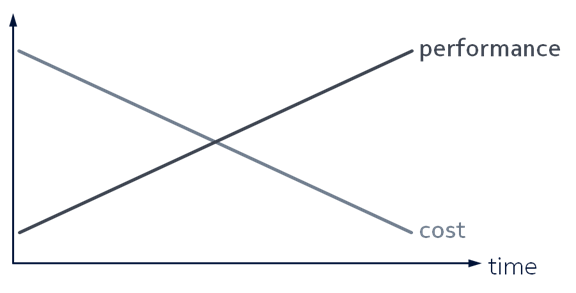 By combining the three preceding charts and admittedly visually cheating with axes, scales, and representations, we can come to the conclusion that the chasm is actually the point where the shift from a technology driven model to a value and customer experience driven business needs to take place. If this doesn’t happen, any new product or technology introduction is doomed to fail. The programmable world will have an immense impact on many industries. Take for example the logistics and transport sector: access to real-time data, like the location of goods, current weather conditions, traffic flows, and up-to-the-moment information on warehouse inventories and capacities, will dramatically reduce the marginal cost of production, storage and delivery of goods. 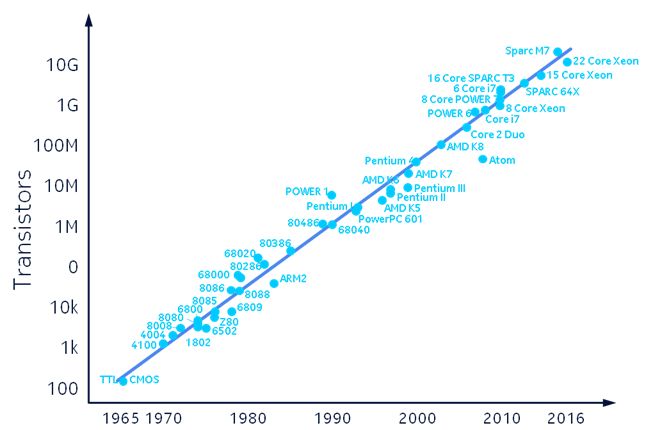 Let’s start the quantitative analysis phase of this paper by looking at Moore’s law. Moore’s law is typically calculated as the number of components per integrated function in an electronic circuit. The theory states that the number of components per given functionality in an integrated circuit doubles every two years. This translates in a number of ways – circuits can get faster at a fixed size, smaller at a fixed speed, lower cost at a fixed speed and size, or infinite combinations of any of the three factors. The end product is optimized based on its intended use. Next, let’s look at quantifying Metcalfe’s law. The objective is to be able to compare Internet users and their implied value to IoT devices to be able to make a relative comparison of potential. We begin with the number of Internet users from 2000-2016. We also obtain a projection of Internet users for 2020. In addition, we plot the number of connected “things” and their respective squared values. In this example, conservative numbers for connected “things” are used, reaching 21 billion by 2020. Some projections go as high as 100 billion “things”. The latter value exaggerates the value of IoT beyond what is used in this example. We plot these values on the following chart, and also plot their “value” based on Metcalfe’s theory with 2013 as the baseline. As the number of devices connected through IoT increases due to Moore’s law, and subsequently drives down the cost of the technology required, the value of IoT accelerates. 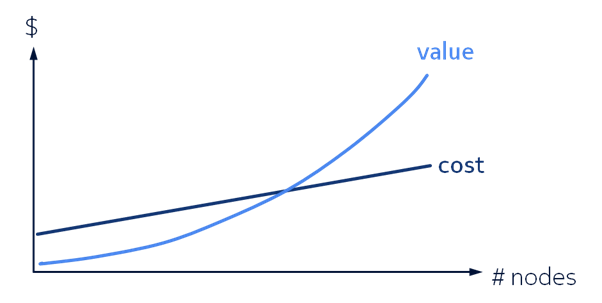 With costs dropping and value increasing exponentially, new business models become viable and sustainable. This is when IoT moves from being a technical “wow” to an actual business, and in other words, it “crosses the chasm”. And acceleration continues because now it can be used to reduce transaction costs and push inefficiencies out of the system. Many of the early IoT applications came to market following a vertical model, in which each solution was implemented on separate infrastructure, which needed a new and/or tailored IT development effort, and used a separate management and execution platform. Such a siloed approach not only has an impact on development, deployment, and operating costs, but it also constrains the opportunity to realize meaningful economies of scale, develop solutions that can apply to more than one vertical market, and benefit from application interworking and data sharing. Although at first sight IoT is all about vertical solutions that beg for a vertical model, there is a clear business rationale for an “any network, any device, any application” platform with a common set of service capabilities, standardized interfaces, and open APIs enabling faster growth and innovation, as a broad variety of devices and applications can use common infrastructure, and share platform functions and data. Actually, a horizontal IoT platform will boost the network’s value as defined by Metcalfe’s law. If we take the example configuration below. When N different vertical applications (A) are deployed on N different “stovepipe” platforms (P) with M connected devices (D)each, then the discrete y-value of Metcalfe’s curve is equal to N*(M+1)². But, if we assume a common, horizontal platform that connects all N applications to all N*M devices, then the network value explodes exponentially to (N*(M+1))². Furthermore, a horizontal platform, with open interfaces and standardized protocols, will allow IoT service providers to reduce investments, lower operational expenses, scale faster, speed up time-to-market, facilitate partnerships, and deliver a better customer experience. While device vendors and application developers can concentrate on their real differentiators, rather than on re-implementing the common functions that will be provided by the platform. Many thanks to my colleague Lee L’Esperance for helping me out with the calculations.